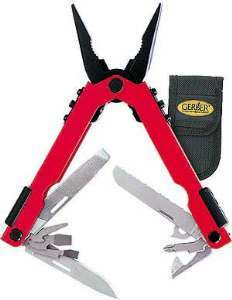 CLOSE OUT $50.00 G-48246, Gerber Red Multi-Lock tool. LIMITED QUANTITIES Stainless steel construction. 5-1/4" overall, 4-7/8" closed, 6" open. 15 components. Black ballistic belt sheath. Made in U.S.A.